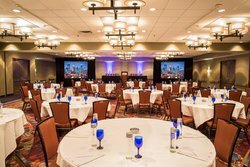 Boasting over 18,000 square feet of flexible meeting rooms in Bloomington, MN, Crowne Plaza AiRE MSP Airport - Mall of America is your premier venue choice for meetings, conferences, trainings, receptions, and special events in the Twin Cities. With a full-service catering menu provided by the hotel, complete audio/visual services, experienced banquet staff, and the expertise of our certified Crowne Meetings Director, we’ll ensure your next event is stress-free and unforgettable. 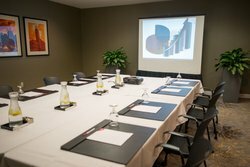 From extravagant events accommodating up to 700 guests in our grand AiRE Ballroom, to more intimate affairs held in our smaller yet dynamic Bloomington, MN meeting rooms, we are well-equipped to host events of all occasions and sizes. The large foyer for exhibits, displays, breaks, and receptions gives you all the flexibility you are looking for in a conference or reception space. Our venues can be set up theater, classroom, conference, and banquet style, complete with all the meeting facilities & services you need for a successful and seamless event. As an added bonus for meeting planners, our special IHG Rewards program will let you earn points towards free stays and merchandise all over the world – just for doing your job! Read about the IHG® Meeting Rewards program below, discover our hotel’s additional on-site amenities, learn more about our Bloomington, MN meeting room capacities and catering services, and start planning your next event at Crowne Plaza AiRE today! Contact our sales team at 952-876-8655 or sales@crowneplazaaire.com. This one-of-a-kind loyalty program rewards you for every qualified meeting*† you hold at over 4,500 hotels within the IHG® Rewards Club family of brands in the United States, Canada, Mexico, Latin America and Asia Pacific. Learn more about IHG® Meeting Rewards here. Crowne Plaza AiRE boasts over 18,000 square feet of meeting rooms in Bloomington, MN! Read some quick facts about our meeting room facilities below, or download our Banquet Room Diagram for capacities and dimensions for each meeting space.